Looking for a bit more in your yoga practice? Join Jim for a 3 class ashtanga based intensive on April 17th - May 1st. We will cover the Rocket series, including a safe breakdown of the optional arm balances and inversions in the sequence. Don’t worry, this is a challenging flow, but accessible for all! 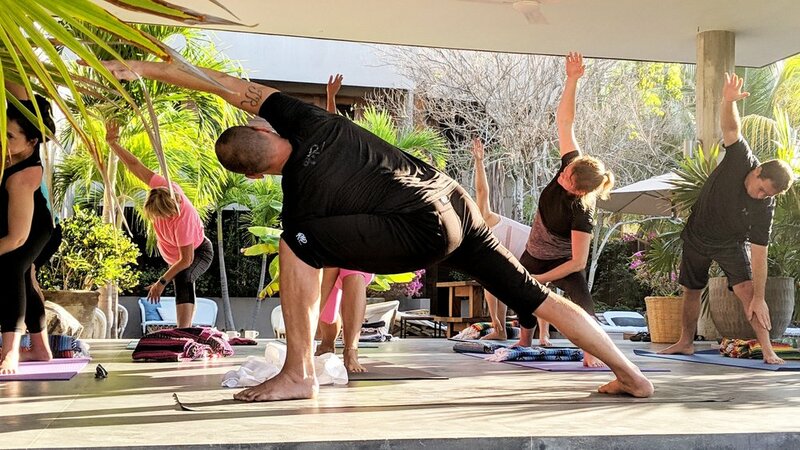 Anyone can benefit from The Rocket, and what I love most about it is that beginners can practice beside experienced yogis, as everyone is learning and progressing. All the arm balances and inversions are optional, and you practice with the wall as a partner. Also, breaks are encouraged, so if your body feels fatigued just hang out in child’s pose or down dog. Larry Schultz, creator of the Rocket, trained with Pattabhi Jois '82 - '89. He took the 3 different series of Ashtanga Yoga, blended them together, and created "Rocket Yoga" in his home of San Fransisco in the 90's. Larry happened to be the yoga teacher of The Grateful Dead. It was actually Bob Weir of The Grateful Dead who suggested to name Larry’s flow the "Rocket," because "it gets you there faster" - so this is a great flow for anyone who wants to get to another level in their yoga ability, build a strong core, and heal their body. Includes all 3 classes in the series. If you would like register or inquire please just fill out the form below and you will receive a confirmation from us via email. Please also know that you can reach us any time at 778-888-3746, or email at info@centeredwithinyoga.com. Payments will be due within one week of registration to secure your spot. We accept cash or cheque at any of our locations. We also accept e-transfers to erin@centeredwithinyoga.com. Please don't forget to send an email to tell us what your password is. If you need to arrange an alternate payment method or have questions, please don't hesitate to contact us!